Well, just because you "can" make gluten-free/dairy-free croissant-like things doesn't mean you "should". Some part of me feels good about giving it a go despite my limitations but the reality is that these weren't any better than Pillsbury Crescent Rolls from the tube and took *considerably* more time to make. Dairy-free croissants, sure-I'd make 'em. Gluten-free ones with real butter and cream, most definitely! !, but another attempt at making something croissant like without both gluten and dairy is not in my future. The kids did eat them so it wasn't a loss on that front. But again, these just aren't good enough and nothing I can think of could change that. Time to make some pot roast instead! -The given recipe for Julia Child's croissants is available here. This recipe comes from Mastering the Art of French Cooking, Volume Two. 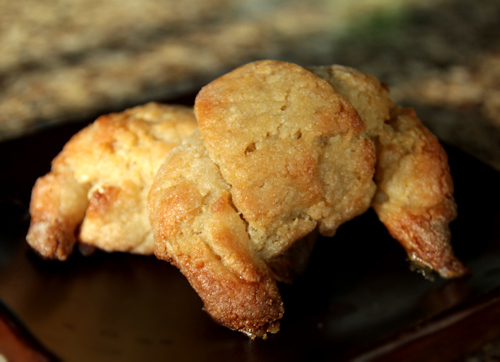 -I attempted the recipe for Gluten Free Croissants from Blog Critic author Bobbie Noto. I replaced the heavy cream and milk with almond milk and the butter with Spectrum butter flavored shortening plus 1/2 teaspoon of salt. You can see more recipes at Bobbie's Baking Blog, look for the Vols-au-Vent recipe for a gluten free puff pastry recipe. 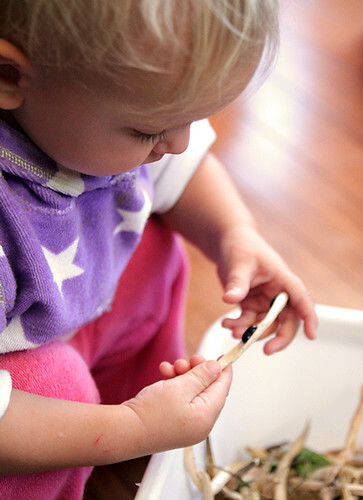 -More Daring Baker-ness can be found on the blogroll. 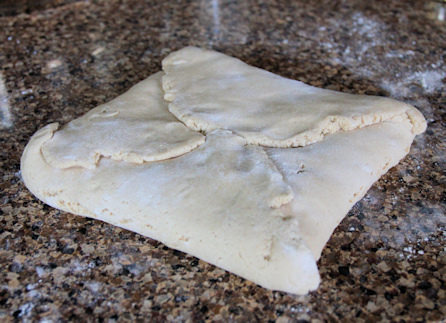 In case you desire a tortuously long process that produces Doughboy results, here are pictures of the "butter" fold to help you along. 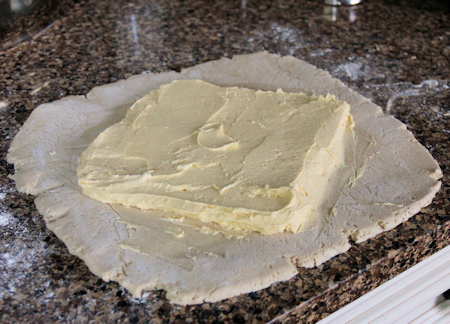 First mold your butter opposite your dough square. 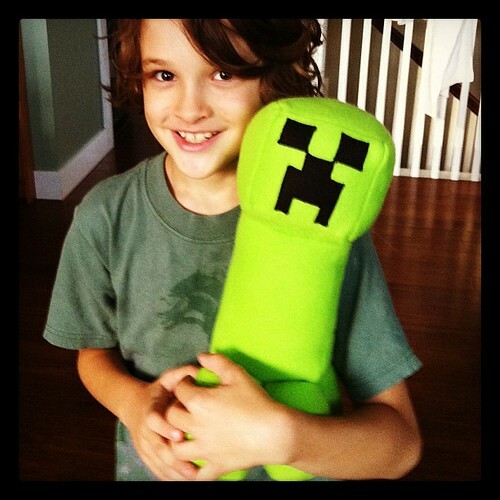 For my more successful ventures this month, Alex loves this Minecraft Creeper plushy we made together. 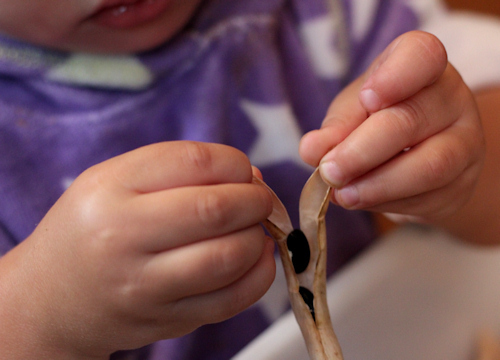 At first appearances shelling beans aren't a very rewarding crop to grow. A 3 foot by 10 foot bed will yield only just barely enough beans for a single pot of soup. And as I am more and more interested in pursuing a more paleo or primal style of eating, beans are generally frowned upon because of their anti-nutrient, high carb, Neolithic status. But there is fun to be had and Penny and I were busy harvesting and shelling today and when it comes time to eat our beans we'll be sure to soak and cook them well. 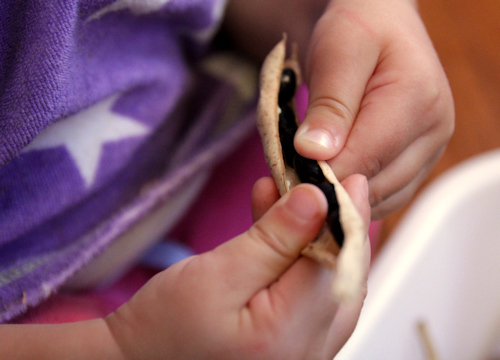 We had three methods of bean removal. The first is the Thumb Slide. The second I call the Zipper Pull. And the third Penny came up with and I named the Tear and Fling. It's not pictured because it results in beans flying in every direction and me scrambling to gather them back up. 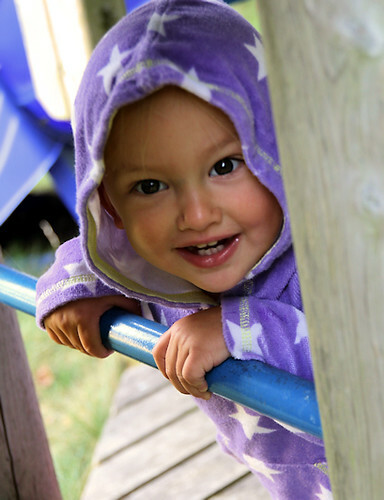 But rest assured Penny wore a smirk like this one while doing it. Bonus video with Penny saying "beans"